An arctic front will make it’s way through the area late tonight, bringing widespread precipitation with it. A very cold air mass will follow and showers will also continue through Sunday into Monday afternoon. Snow levels will fall to west side valley floors [Rogue Valley] late tonight, remaining there through Monday. All area passes will be affected by accumulating snow and even the beaches will likely see some snow accumulations Sunday into Monday. Showers will taper off Monday afternoon and temperatures will drop significantly Monday night into Tuesday. Watch out for black ice Monday night through Wednesday morning as these very cold temperatures will cause any wet road surfaces to refreeze. If you have travel plans during this timeframe, be prepared for wintry travel conditions and be sure to check road conditions before venturing out! WHAT...Snow, heavy at times, expected. For the Warning area, total snow accumulations of 5 to 8 inches are expected. For the Advisory area, total snow accumulations of 1 to 4 inches are expected. WHERE...The Warning area includes mountain passes on Interstate5 from Grants Pass to Roseburg, Camas Mountain on Highway 42,and Hayes Hill on Highway 199. The Advisory is for valleys west of the Cascades to include the Umpqua, Illinois, Applegate, and Rogue. Cities affected by the Advisory include, but are not limited to, Medford, Ashland, Cave Junction, Grants Pass, Shady Cove, and Roseburg. WHEN...For the Winter Storm Warning, from 1 AM Sunday to 4 AMPST Monday. For the Winter Weather Advisory, from 4 AM Sunday to10 AM PST Monday. 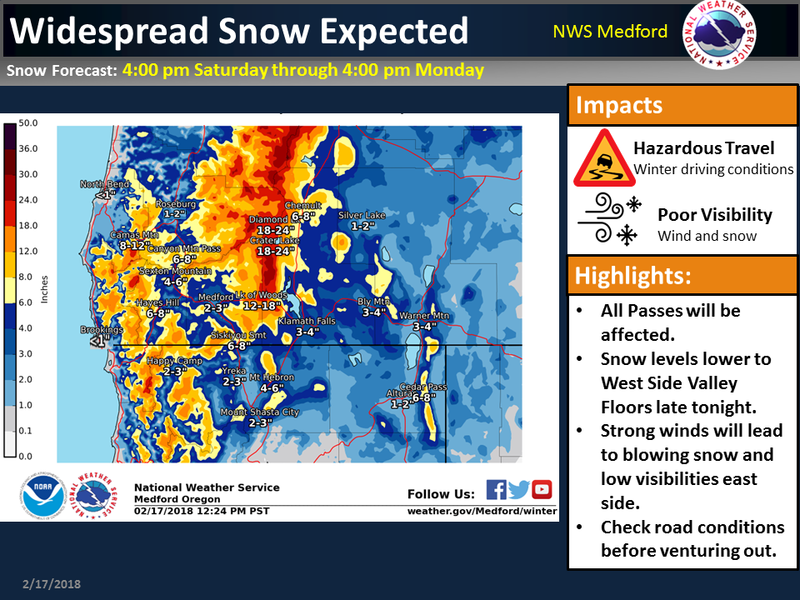 The heavier snow on the lower mountain passes is expected Sunday morning. Road temperatures and spotty precipitation will limit impacts during the day on Sunday in lower valleys. ADDITIONAL DETAILS...Plan on difficult travel conditions. Be prepared for significant reductions in visibility at times. Wet roads Sunday afternoon will likely freeze and turn icy Sunday night. Travel is strongly discouraged because of dangerous conditions. * If you must travel, keep tire chains, a flashlight, blankets, food, water, medications, and a fully charged phone with you. * The safest place during a winter storm is indoors. A Winter Storm Warning means that severe winter weather is likely and poses a threat to life and property. Take protective action now. WHAT...Snow and blowing snow expected. Snow accumulations are3 to 6 inches. WHERE...Portions of Klamath County including Highway 97 from Modoc Point to Crescent. WHEN...From 1 AM to 7 PM PST Sunday. ADDITIONAL DETAILS...Plan on slippery road conditions. In addition, areas of poor visibility are likely. Tree branches could fall. Winds gusting as high as 45 mph will cause areas of blowing and drifting snow. Slow down and allow extra time to reach your destination. * Carry tire chains and be prepared for snow covered roads and limited visibilities. Winds in the warning area: West to southwest 40 to 50 mph with gusts up to 65 mph. Winds in the advisory area: West to southwest 30 to 40 mph with gusts up to 50 mph. Timing: Strong winds continue through Sunday evening. Locations in the warning include: The higher terrain of eastern Klamath County and western Lake County between Bly and Silver Lake. This includes Highway 31 between Summer Lake and Paisley. Locations in the advisory include: Most of the rest of eastern Klamath and Lake Counties. This includes portions of Highways 140 and 395 and the city of Lakeview. Very difficult travel, especially for high profile vehicles. Additionally, loose objects could be blown away. Precautionary/preparedness actions...Slow down and use caution when driving, especially if you are driving a high profile vehicle. Secure any loose objects like patio furniture or trash cans or bring them indoors. A Wind Advisory means that winds of 35 mph are expected with higher gusts possible. Very difficult travel, especially for high profile vehicles. Additionally, loose objects could be blown away. Precautionary/preparedness actions...Slow down and use caution when driving, especially if you are driving a high profile vehicle. .Secure any loose objects like patio furniture or trash cans or bring them indoors.